While Uzbek cuisine is perhaps best known for its signature dish plov—a beloved rice and meat combination that has just about as many variations as there are cities in Uzbekistan—the country’s traditional food culture features many other dishes that are just as delicious, if not quite as famous. Following are some of the most mouthwatering examples of Uzbek cuisine. 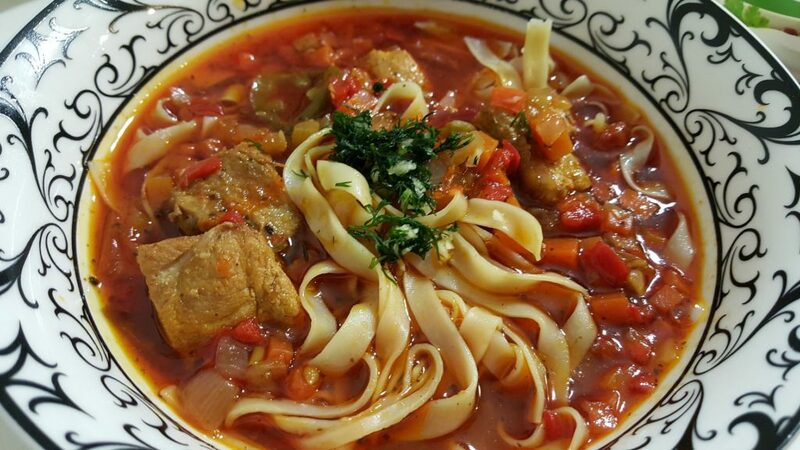 Uzbekistan’s answer to ramen, lagman is a meaty, spicy broth full of fresh, handmade noodles. The noodles are usually cooked separately before being topped with the broth, vegetables, and chunks of meat (lamb is commonly used, but beef is also a popular choice). In some regions, lagman is served with plenty of broth. In others, the dish is much less like a soup and more like a noodle dish. A fresh salad appetizer commonly starts off most Uzbek meals, and this salad of sliced eggplants, radishes, and peppers served on a bed of greens and garnished with parsley is a classic example. A dish that’s almost as widespread as plov, chuchvara features small dumplings (packets of handmade dough stuffed with beef or mutton) boiled in water or broth and seasoned with pepper, onion, and tomato paste. Chuchvara is usually served with suzma, or sour milk: Uzbekistan is well known for its delicious fermented dairy products such as suzma and katyk, a yogurt made from sour milk. Named in honor of Uzbekistan’s capital city, this trademark salad mixes fresh greens, radishes, and boiled beef tongue with a special yogurt dressing. The salad is served topped with crispy fried onions. 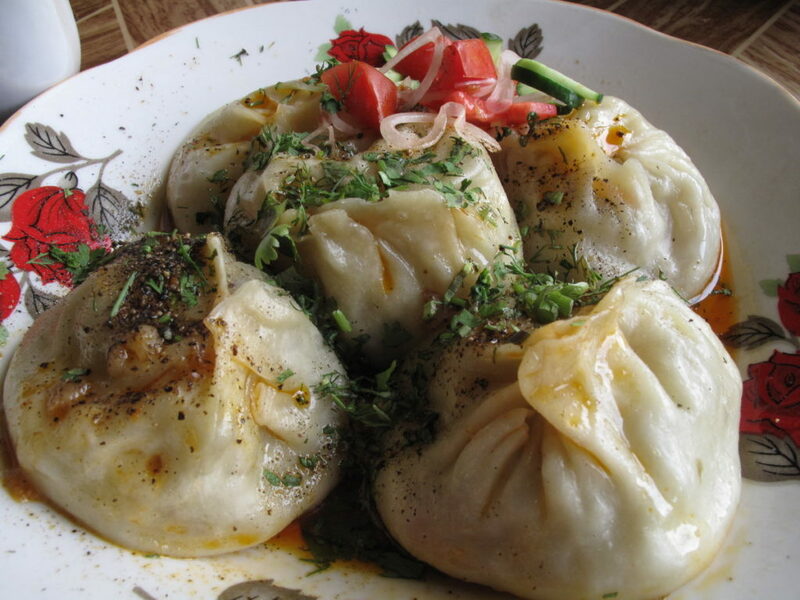 Almost every culture in the world has some form of dumpling, and the steamed dumplings known as manty are the standard in Uzbekistan. Sprinkled with dill and served with sour cream or suzma, manty can feature a range of fillings, from meat to vegetables to spices. A popular dish, manty is often served at the end of a meal in many regions. This triangular pastry calls to mind the similarly named (and shaped) samosa. Crunchy on the outside and soft on the inside, samsas get their unique texture from being baked in a tandoor oven. Pumpkin is a very common samsa filling, as are ground lamb and herbs. While vegetables are not usually eaten on their own in Uzbek cuisine, fresh salads are often served at the beginning of a meal (like the eggplant salad previously mentioned) or as a side dish. As such, they are presented simply with an emphasis on freshness to complement the rich meat dishes that are more typical Uzbek fare. Achichuk salad is a perfect example: nothing more than thinly sliced and seasoned tomatoes and onions, it’s a light but still flavorful addition to an Uzbek meal. Prepared all over Uzbekistan and a historical favorite of traveling merchants, naryn is a dish of hand-pulled egg noodles served with boiled meat, minced onions, and black pepper. While thinly sliced horse meat is traditionally used, beef is a common substitute. Uzbekistan can experience some harsh weather and low temperatures during the winter months, so it’s not surprising that hearty soups are an important part of Uzbek cuisine. Shurpa is just such a soup: the base of the dish is a bouillon of fatty meat, which is added to the soup either fresh or after it has been fried, along with sliced carrots and onion rings. As for the rest of the ingredients, they vary from one region to another, with some recipes using turnips or peas, and others calling for fresh tomatoes and sweet peppers. This substantial braised stew contains meat, onions, potatoes, and other vegetables, and sometimes fruit, as well. It’s usually served garnished with dill, a hugely popular herb in Uzbek cuisine. Flatbread is an important part of most Central Asian cooking, and Uzbekistan is no exception. Kutabi are deliciously fluffy flatbreads that are deep-fried and then served plain or filled with meat or vegetables. Western foodies might be more familiar with shaslik’s more commonly used name: kebabs. Chunks of lamb, chicken, or spiced mutton are grilled on steel skewers and served topped with a huge pile of sliced raw onions. The dish is often accompanied by adjika, a spicy sauce—bright red in color—that is made from hot peppers. Uzbek cuisine is unquestionably focused more on meat-based main dishes than on sweets, but that doesn’t mean that there are no traditional Uzbek confections. Holvaytar is perhaps the closest thing that the country has to a national dessert. A flour-based version of halvah—the best-known version of halva is a nut-based recipe made from sesame seeds—holvaytar is made by combining sugar, flour, and butter together until it forms a thick and creamy paste, which is then left to set in shallow dishes. Holvaytar is usually served with walnuts or other nuts, and it is traditionally cooked by someone moving into a new house as a gift for their neighbors.